Empirical evidence suggests that employees at Wal-Mart earn lower average wages and receive less generous benefits than workers employed by many other large retailers. But controversy has persisted on the question of Wal-Mart’s effect on local pay scales. Our research finds that Wal-Mart store openings lead to the replacement of better paying jobs with jobs that pay less. Wal-Mart’s entry also drives wages down for workers in competing industry segments such as grocery stores. Looking at the period between 1992 and 2000, we find that the opening of a single Wal-Mart store in a county lowered average retail wages in that county by between 0.5 and 0.9 percent. In the general merchandise sector, wages fell by 1 percent for each new Wal-Mart. And for grocery store employees, the effect of a single new Wal-Mart was a 1.5 percent reduction in earnings. When Wal-Mart entered a county, the total wage bill declined along with the average wage. Factoring in both the impact on wages and jobs, the total amount of retail earnings in a county fell by 1.5 percent for every new Wal-Mart store. Similar effects appeared at the state level. With an average of 50 Wal-Mart stores per state, the average wages for retail workers were 10 percent lower, and their job-based health coverage rate was 5 percentage points less than they would have been without Wal-Mart’s presence. Nationally, the retail wage bill in 2000 was estimated to be $4.5 billion less in nominal terms due to Wal-Mart’s presence. The study addressed a number of methodological issues that have plagued previous attempts to assess the effect of Wal-Mart on local labor markets. A less sophisticated statistical model risks confounding the effects of Wal-Mart openings with unobserved economic factors (positive or negative) that might have drawn the retailer to specific locations. We use the spatial pattern of Wal-Mart’s growth (radiating out of Arkansas over time) to identify Wal-Mart store openings that are not driven by local economic conditions. This helps ensure we are measuring the results of store openings, not preexisting conditions. Further, we investigate (and reject) the possibility that wage declines were an artifact of changes in demographics of the retail workforce. If Wal-Mart jobs bring more minorities, women, young people or workers with lower educational attainment into the retail work force, the wage decline could be accounted for by the lower earning potential of these groups. But controlling for age, gender, ethnicity and education did not change the results. Overall, the results strongly support the hypothesis that Wal-Mart entry lowers wages and benefits of retail workers. There are two general problems with comparing Wal-Mart workers’ wages with those of other retailers. Wal-Mart started and has its greatest presence in lower-wage and more rural areas, which will account for some part of the wage differential. Second, Wal-Mart makes up a large share of general merchandise workers, giving it a significant impact on the average wage of these workers. Its employees account for 55 percent of all general merchandise workers, and 71 percent of employees who work for large general merchandise companies in the country. To get a valid comparison with other general merchandisers, we adjusted retail wages in the Current Population Survey to match Wal-Mart’s location and adjusted for Wal-Mart’s contribution to the average general merchandise wage. Anecdotal evidence suggests that competitors perceive the need to lower wages and reduce benefits to compete with Wal-Mart. In 2003, as Southern California unions negotiated their contracts with grocery chains, competition with Wal-Mart came up repeatedly as a rationale for lowering wages and cutting benefits.5 Although such anecdotal accounts are common and reported often in the media, there is not much in the way of rigorous academic research on this question. We sought to test the hypothesis that Wal-Mart store openings depress local wages and benefits. Our research investigated the effect that a new Wal-Mart store had on the economy of the surrounding county and state by comparing how wages for retail workers, especially grocery and general merchandise employees, changed over time in response to a store opening. Any effort to estimate the impact of individual store openings in a credible way encounters a fundamental methodological obstacle: Wal-Mart does not randomly choose where to expand. In deciding where to open a new store, management may take into account several factors, including the cost of labor. If the company selects areas where wages are already falling in order to minimize competition for employees, the results might artificially indicate that Wal-Mart’s arrival in a county caused wages to fall. Alternatively, and more important in reality, Wal-Mart may choose sites with strong economic prospects to take advantage of a healthy consumer market. Such local booms usually lead to an uptick in workers’ wages. When Wal-Mart store openings are correlated with local economic booms, the results would mistakenly indicate that Wal-Mart raised wages or had no effect on local wages–even when its entry caused wages to be lower than they would have been. In either case, there is the danger of confusing the factors enticing Wal-Mart to open a particular store with the effects of the store’s arrival in the local economy. This problem is what economists call selection bias. By following the ripple of store openings across the country and over time, we are able to test whether retail wages fell in its wake. 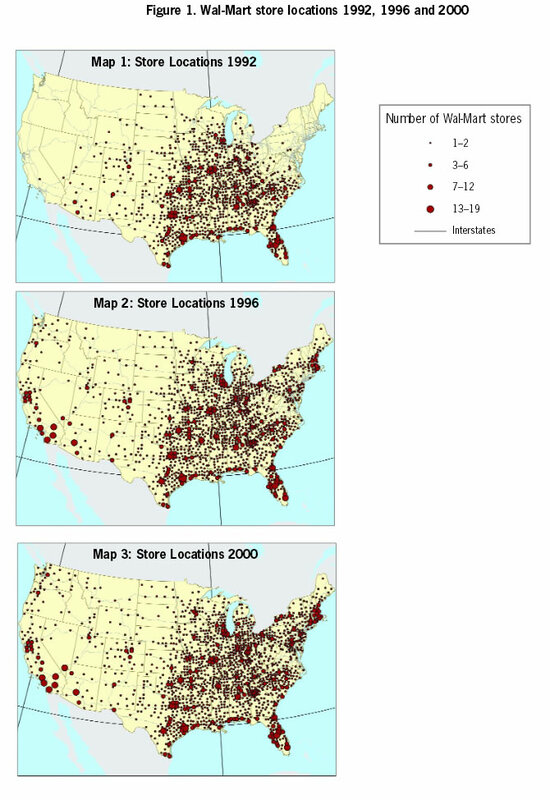 Looking at store openings based on both how far the county is from Wal-Mart’s “ground zero” and the year in question, our estimates avoid the selection bias that can be a problem for similar studies. We also subject our results to a number of different tests of internal and external validity, which all indicate that our methodology is robust. Our study uses two sources for data on wages: the Quarterly Census of Employment and Wages, employed by the US Bureau of Labor Statistics, which provides county-level information; and the March Supplement to the Current Population Survey, which provides greater detail about wages and benefits, but only at the state level. The study focuses on the period 1992–2000, the time period when Wal-Mart expanded outside the South and exploded into major metropolitan areas. During this time, Wal-Mart grew from 1,800 US stores to 2,500, an increase of almost 40 percent. During the 1990s, the corporation expanded from the South to the Midwest, and then to the West and Northeast. By the end of the 1990s, more than half the counties in America had a Wal-Mart in them, and some had many more. In 1992, half the Wal-Mart stores were in rural counties. But during the next eight years, three-quarters of new stores were in metropolitan counties, as Wal-Mart expanded from its rural starting point. When Wal-Mart’s timing of expansion is taken into account, we find strong evidence that each new Wal-Mart lowered retail wages (see Table 1). Opening a single Wal-Mart store lowers the average retail wage in the surrounding county between 0.5 and 0.9 percent. In the category of general merchandise, wages fell about 1 percent for each new store, while workers in grocery stores saw average wages decline about 1.5 percent. As we would expect, there was no noticeable effect on wages in other low-paying economic sectors that did not compete with Wal-Mart. Restaurant workers, for example, saw no change in their take-home pay as a result of big box entry into their county. Some research suggests that Wal-Mart may be responsible for a small net increase in jobs.8 Our study demonstrates that the opening of new Wal-Mart stores produces a decline not just in average wages but in the total wage bill of a county. Every new Wal-Mart in a county reduced the combined or aggregate earnings of retail workers by around 1.5 percent. Given that the fall in total wages was greater than the decline in average wages, it is highly unlikely that there is compensating positive employment growth associated with a Wal-Mart store opening. This is consistent with research by Neumark et al.,9 who find that once the timing of store openings is taken into account, there is no evidence of job gains. Wal-Mart’s effect on earnings of grocery workers is particularly striking. The opening of a single Wal-Mart store lowered grocery wages by 1.5 percent. This is in large part because supermarkets typically pay higher wages and have higher rates of unionization than other retail businesses. In 2005, the unionization rate in supermarkets was 21 percent, compared to 5 percent in general merchandising and 6 percent in retail overall. Wages of unionized supermarket workers are 27 percent higher than their non-union counterparts, as compared to a 6 percent union wage premium for general merchandise and 8 percent for all retail workers.7 Because of higher wages and the greater advantage to union membership, competition with a large low-wage, non-union employer like Wal-Mart is particularly significant in the grocery sector. Wal-Mart sells groceries and competes with grocery stores, but its workers are categorized as general merchandise employees, not grocery workers. The average wages for grocery workers does not include Wal-Mart workers. Hence, the decline in grocery worker wages found in the research results must be due to a decline in wages among Wal-Mart’s competitors in the grocery industry. We also perform a state-level analysis of Wal-Mart’s impact. By the year 2000, there were 2,500 Wal-Mart stores in the US, an average of 50 per state. Our study finds that each new Wal-Mart lowered the average hourly wage of retail workers in the surrounding state by two-tenths of a percent (see Table 2). Fifty new Wal-Mart stores would mean a 10 percent average wage reduction. Just as Wal-Mart’s low wages depressed wages in competing businesses, we found similar effects on the rate of health insurance. The research demonstrates that 10 new Wal-Mart store openings in a state translated to a 1 percentage point reduction in the proportion of retail workers who received health insurance from their employer. Wal-Mart’s effect on county wages appeared only in metropolitan statistical areas. The strong decline in earnings that was evident in metropolitan counties did not show up in rural counties. This result is consistent with other research that shows that rural areas are more likely to have low-wage firms.12 Where wages are low to begin with, the arrival of the retail chain is less significant. This is especially true because the minimum wage becomes binding at low wage levels, which is more likely in rural areas. In metro areas with better-paying jobs and a higher rate of unionization, Wal-Mart’s entry was more likely to have an impact on the labor market. This is particularly important since the large majority of new Wal-Mart stores are located in metro areas. This also explains the greater resistance to Wal-Mart store locations in metropolitan compared to rural areas, since workers and unions have more to lose in urban settings. One possible explanation for the apparent reduction in wages is a change in the mix of the workforce. If Wal-Mart hires more minorities, women and young-people than its competitors, then the wage difference could be explained by the lower earnings of these groups, regardless of where they work. A related possibility could be a change in hours of work, skills of workers and fringe benefits. If Wal-Mart hires disproportionately more part-time workers or less skilled workers, for example, then the apparent decline in average wages might not result from a reduction in wages for comparable employees. In order to investigate this possibility, we use the Current Population Survey data (from the Annual Demographic Supplement), which provides details on individual worker characteristics. We look at the impact of Wal-Mart expansion in a state on the average hourly wages for retail workers (as opposed to earnings per worker in our other dataset, the QCEW), and control for the demographics of the workforce, i.e., gender, age, education and race, as well as the average wage of workers without a college education.13 Controlling for these factors does not change the overall conclusion. Wal-Mart’s effects on wages in surrounding areas created lower wages for a set of retail workers, not a change in who was working retail. Until now there have been few studies documenting the effects on compensation from Wal-Mart’s entry into a new labor market. The few studies that do address the question focus on a small set of counties in primarily rural states. Because of methodological limitations, none are able to distinguish the effects of Wal-Mart’s arrival from the particular conditions that attracted the retailer to open in a given area in the first place. The new research strongly suggests that Wal-Mart entry lowers wages for employees in competing businesses, and the effect can be seen at both the county and state levels. Controlling for demographic or skill mix of the workforce cannot explain the results. Wal-Mart openings depress average and aggregate wages and reduce the proportion of the workforce that is covered by employer-sponsored health insurance. Of course, Wal-Mart’s presence is also likely to bring lower prices. Existing research shows big-box stores like Wal-Mart can use their distribution systems and leverage with suppliers to produce substantial savings to consumers.14 However, to the extent that competing on cost produces negative effects on low-wage workers, this is an important consideration when deciding the “rules of the game” that big-box retailers need to abide by. And since wage and benefit savings are not the main part of the cost advantage for a company like Wal-Mart, it could continue to pass on most of these savings while paying higher wages and benefits. These factors should be taken into account by policy makers in their decision-making on economic development. We would like to thank Judith Barrish for support in writing and editing this brief. We also appreciate the helpful comments and reviews we received from Emek Basker, Jared Bernstein, Oeindrila Dube, David Fairris, Michael Hicks, Ken Jacobs, Ethan Kaplan, Alexandre Mas, Suresh Naidu, and seminar participants at IIES (University of Stockholm), University of Uppsala, University of California–Berkeley, University of California– Riverside, Center for American Progress, Economic Policy Institute, American Enterprise Institute, and the Annual Conference of the American Sociological Association.– We also wish to thank General Service Foundation, which provided partial funding of this research. Wal-Mart Stores, Inc. 2005. http://www.walmartfacts.com/associates/default.aspx#a41. Dube, Arindrajit and Ken Jacobs, 2004. Hidden Cost of Wal-Mart Jobs: Use of Safety Net Programs by Wal-Mart Workers in California. University of California–Berkeley, Center for Labor Research and Education. Bernhardt, Annette, Anmol Chaddha and Siobhan McGrath, 2005. What Do We Know About Wal-Mart? New York University Brennan Center for Justice. Dube, Arindrajit and Steve Wertheim, 2005. Wal-Mart and Job Quality: What Do We Know, and Should We Care? University of California–Berkeley, Center for Labor Research and Education. Goldman, Abigail and Nancy Cleeland, 2003. “An Empire Built on Bargains Remakes the Working World,” Los Angeles Times (November 23, 2003). Pearlstein, Steven, 2003. “Wal-Mart’s Hidden Costs,” Washington Post (October 29, 2003). Graff, Thomas O., 1998. “The Locations of Wal-Mart and Kmart Supercenters: Contrasting Corporate Strategies,” The Professional Geographer 50 (1): 46-57. Holmes, Thomas J. 2005. The Diffusion of Wal-Mart and Economics of Density. Unpublished manuscript. Basker, Emek, 2005. “Job Creation or Destruction: Labor Market Effects of Wal-Mart Expansion,” Review of Economics and Statistics 87(1): 174-183. Neumark, David, Junfu Zhan and Stephen Ciccarella, 2005. “The Effects of Wal-Mart on Local Labor Markets,” NBER Working Paper No. 11782. .
On average, a single store reduced the retail wage bill by 1 percent in a metro county. In 2000, metro counties had an average of 1.5 Wal-Mart stores, and had a total retail wage bill of $300 billion. This produced an annual reduction in the nominal wage bill by $4.5 billion. Anderrson, Fredrik, Harry Holzer and Julia Lane, 2002. “The Interaction of Workers and Firms in the Low-Wage Labor Market,” LEHD Working Paper. To be sure, whether or not lower wages bring in more disadvantaged groups does not change the fact that wages are reduced for retail jobs. Our analysis further shows that this cannot “explain” the fall in wages. Hausman, Jerry and Ephraim Leibtag, 2005. “Consumer Benefits from Increased Competition in Shopping Outlets: Measuring the Effect of Wal-Mart,” NBER Working Paper No. 11809. Wal-Mart…the Race to the Bottom – Rohnert Park Super-Center? Walmart in Boulder: A ‘Faustian bargain’? What would it cost Wal-Mart to increase pay?